Hand-crafted from high quality rose quartz crystals (used by the ancient Greeks and Egyptians to retain their youthful beauty) White Lotus’ luxurious roller utilises ancient Chinese methodology to increase micro-circulation and stimulate lymphatic drainage while massaging skin and toning underlying muscles. The perfect addition to your daily skin ritual, not only does the texture of the stone feel beautifully cool and soothing, the rolling motion also reduces puffiness and helps to eliminate accumulated toxins, ‘lifting’ your face and neck – this smallest size is great around eyes. With reinforced brackets and a sleek, chic design, this will look beautiful in your bathroom #shelfie while reaping impressive results. 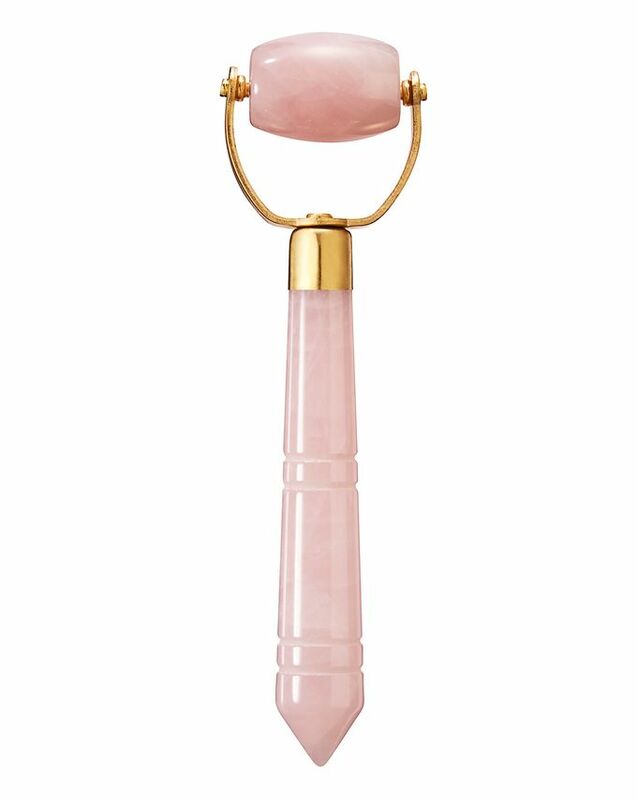 Hand-carved from grade A rose quartz crystals (used by ancient Greeks and Egyptians to retain youthful beauty) this roller utilises ancient Chinse methodology to increase micro-circulation in your skin and stimulate lymphatic drainage while massaging skin and underlying muscles. A perfect way to supplement your daily skin care ritual, not only does the texture of the stone feel infinitely soothing (ideal at the end of a loooong day) and reduce puffiness, the rolling motion also boosts elimination of accumulated toxins and helps to bring relief from stubborn tension headaches if you roll it on your temples. Firming and toning the skin as it rolls, this elegant tool can also help to minimise discolouration and even out texture, tone and clarity. Use it around your eyes and, with regular use, fine lines can be reduced and dark circles diminished – it even works to reduce persistent wrinkles (it’s great for combatting ‘elevens’). Store in the fridge to enhance the relaxing and tightening benefits. It’s delivered in its own traditional silk-lined box to increase the air of luxury – and the brass brackets are reinforced so you won’t have to worry about breakage. The roller can also be used on the delicate throat area. The whole procedure should take about 5 minutes. Can be used with or without serums. Genuine Crystal - Only Grade A quality Rose Quartz Crystal is used to produce the White Lotus Rose Quartz Roller. This is really 100% genuine rose Quartz! Very nice roller, I'm so happy with it! Just a quick one today. I love this little roller it is perfect around the eyes. I had another jade roller from White Lotus previously which I loved but it was too chunky for these finer areas. The new rose quartz one is great for these areas and personally I think the stone is a bit smoother than the jade which is even better for the delicate skin. Very happy to give this one 5 stars!